Have you ever wondered how your things get between here and Mexico? If not, that's probably thanks to transportation and logistics companies getting the job done. However, it's not simple, and it's very important...$376.6 billion annually important. Many Arkansas trucking companies have made this a part of their business portfolio, but one in particular has prioritized it. Between a trucking conference in Oklahoma and my second earnings season, I have been a little caught up in my beat. But even though the story ran a few weeks ago, I thought I would still share it. Many Arkansas trucking companies include service in and out of Mexico in their portfolios, but P.A.M. Transportation Services Inc. in Tontitown has worked to make it a featured specialty. In 2015, 5.5 million truck movements transported $376.6 billion worth of goods across the U.S.-Mexico border, and since 1995, U.S. exports to Mexico have grown 355 percent. It's an important market for both countries, though that doesn't mean it's easy. "I've heard U.S. carriers say, 'We're going to expand to Mexico.' And I think to myself, 'How are you doing that? What's your plan?'" said Dan Cushman, president and chief executive officer of P.A.M. "Because, yeah, it's a great opportunity, but I've got to tell you, if you don't cross all your t's and dot all your i's you're going to get in trouble. I've seen carriers start a Mexican service and all of a sudden you're out because you didn't fully commit." P.A.M. Transportation trucks cross the Mexico border at Laredo, Texas. Besides the language barrier, the traffic laws and regulations differ vastly between the two countries. For example, Mexico has no hours-of-service equivalent on the books. Another layer of complexity involves the U.S. Customs and Border Protection's Customs-Trade Partnership Against Terrorism program. The certification, now standard for carriers working in and out of the U.S., classifies compliant companies as low-risk, which generally speeds up border crossings. Companies must pass regular facility and equipment inspections to maintain membership. As a result of these circumstances, most carriers' preferred modus operandi -- known as through trailer service -- entails switching a trailer between up to three different tractors and drivers: an American trucking company drives to a gateway such as Laredo, Texas, and passes off the trailer to a shuttle carrier that takes it across the border, where it is finally switched to a Mexican partner carrier that completes the delivery. Then the trailer is loaded up with new cargo and sent back to the U.S. the same way. "In my opinion, it's a better and safer model," said Billy Cartright, senior vice president of operations at USA Truck in Van Buren. USA Truck does about 20 percent of its business in and out of Mexico using the through trailer service model. "The Mexican drivers have done it; they know how to do it. I don't need to intervene in that," Cartright said. "It's better to leave it at that than try to educate my fleet of 2,000 drivers." Another component of the decision is safety, Cartright said. "The safety of our drivers is important, so we feel more comfortable operating with our partners down there who know how to do it right." Since Cushman's arrival at P.A.M. in 2009, he has prioritized expansions in Mexico, now about 45 percent of total business. P.A.M. de Mexico has an office based in Monterrey, Mexico, with 16 employees handling everything from customer service and collections to sales. They also manage 45 partner carriers and conduct annual quality control reviews of those partners. Fernando Gonzalez, vice president of P.A.M. de Mexico, runs the office and explained that his job encompasses all components of P.A.M.'s business in the country. "We average 750 trailers inside Mexico at a time, so one of the main responsibilities is to make sure that those trailers run in and out quickly," Gonzalez said. This means checking on customers, handling any safety or security issues, dealing with any border problems and staying aware of new Mexican regulations. Gonzalez explained that through trailer service has become an "industry standard," as opposed to a U.S. company adding an in-house Mexican carrier to handle its business. Notably, J.B. Hunt experimented with this model with Hunt de Mexico in the early 1990s, though today they use the through trailer service model favored by most competitors. The company had no comment for this story. According to Cushman, creating a Mexican entity tends not to work because customers develop trust in certain Mexican carriers and are often unwilling to take a risk on new ones. His board of directors periodically floats the idea of buying a Mexican carrier and establishing their own, which he always cautions against. When visiting prospective customers, he said, "Nine out of 10 times they will ask who we use for our Mexican carriers," and then that customer makes clear they only do business with a certain carrier. Carriers with Mexican entities then have to approach the competitor the customer prefers to keep the business. Those other Mexican carriers, however, "know you will be trying to sell [the customer] on your own services the whole time," Cushman said. Beyond that, it is difficult to get insurance coverage for a Mexican entity, said Sean McNally, vice president of public affairs and press secretary of the American Trucking Associations. Even though ABF Freight and ABF Logistics make less than 5 percent of their revenue in and out of Mexico, Kathy Fieweger, chief marketing officer for Fort Smith-based ArcBest Corp., called it "very" important to their portfolio. "It's about capabilities and full-scale supply-chain services," she said. Cartright at USA Truck called it a "critical" part of their offerings. "It's another feather in our cap to say that we can provide this solution." "Our Mexico service operations differentiates us," Cushman said. A reputation for being able to manage that process lends P.A.M. "instant credibility," he explained, because others know how complicated it can get. "I look at Mexico as a brotherly country," he said of doing business there. "They're an extension of who we are and what we are. And when I go to Mexico, I believe that that's how they view me. It's such a great partnership." J.B. Hunt Transport is the Fortune 500 trucking company based in Lowell, Arkansas that comprises a large part of my beat coverage. Its late founder is being inducted into the Supply Chain Hall of Fame tomorrow (alongside Henry Ford and Malcolm McLean) for his industry-changing deal with the Santa Fe Railway Company, which made intermodal transportation work for the first time. I heard from his widow and business partner Johnelle Hunt for the occasion, as well as many others from the company and industry about how intermodal happened, and why it's such a big deal. It's a long story, but trust me, a lot shorter than I could have written, given all that people wanted to say on the subject. Over the few hours I spent interviewing Mrs. Hunt, 84, I learned a great deal about her husband, the early days of trucking in NW Arkansas and that she has an admitted weakness for shoes (as her husband had one for cowboy hats). We also realized that in fact, one could argue she helped create my job, since the paper has a reporter covering each of the three Fortune 500 companies and their industries here: Walmart, Tyson Foods and J.B. Hunt. We spoke in the penthouse office he had designed, which remains much as he left it, featuring panoramic views, much memorabilia and "J.B. Hunt" embedded in the marble floors. I was, therefore, surprised when she said she's thinking about moving. When I asked why, she replied, "Well, we have about 16,000 square feet here, and we don't need this much space. I can rent that out for a lot!" Johnelle and J.B. Hunt stand in front of one of their trucks in 1988. Johnelle Hunt’s late husband, J.B. Hunt, will be honored Tuesday by the Council of Supply Chain Management Professionals’ inaugural Supply Chain Hall of Fame class. J.B. and Johnelle Hunt on their wedding day, January 19, 1952. Johnnie Bryan Hunt was a truck driver in Little Rock when he suggested to his wife, Johnelle, that he quit to start a new business in Stuttgart. Tired of being home alone, she made him promise one thing: "that we will never own another truck." She tells the story with a laugh because years later, in 1969, Johnnie Hunt bought five tractors and seven trailers. J.B. Hunt Transport Services Inc., the company it has become, last year boasted $6.2 billion in revenue, making it the fourth-largest for-hire trucking company in the country. Forbes currently ranks Johnelle Hunt as the fifth-wealthiest self-made woman in the U.S.
One of the reasons for the growth was J.B. Hunt's partnership with the Santa Fe Railway Company in 1989, the first successful venture in intermodal transportation between the rival industries. The idea was to share freight between the modes to maximize the long-haul efficiency of rails with the short-haul capabilities of trucks. Kirk Thompson, then president and current chairman of the J.B. Hunt board, called it "one of the best decisions in the history of J.B. Hunt Transport." Johnelle Hunt dubbed it "our golden goose." The foresight and willingness to take an expensive risk earned Johnnie Hunt a spot in the Council of Supply Chain Management Professionals' inaugural Supply Chain Hall of Fame class. The criteria for admission? Supply chain professionals who have "changed the world we live in," said Brian Hancock, a member of the council's board and chairman of the hall of fame development committee. He will be inducted alongside Henry Ford, the founder of Ford Motor Co., and Malcom McLean, the developer of the modern shipping container and a friend of Johnnie Hunt. Though Johnnie Hunt died in 2006, Johnelle Hunt and their two children will attend the the council's annual conference in Florida to accept the award on his behalf Tuesday. "J.B. Hunt said, 'I'm willing to forgo my driver, truck and trailer and share that with the railroad, because I think it's more valuable for the U.S. economy and my customers,'" said John Kent, director of the supply chain management research center at the Walton College of Business at the University of Arkansas in Fayetteville. "It was really risky for anyone in a trucking company to go out on that limb and disrupt the trucking business. Most of us humans won't do it, but for entrepreneurs, it's part of being an entrepreneur." "Sometimes I would say, well he never did go to school and learn that you can't do it," Johnelle Hunt said of her husband's entrepreneurialism. Johnnie Hunt, one of seven children raised during the Great Depression in Cleburne County, started school at age 4 but dropped out in seventh grade. The 10-year-old had to go to work cutting timber at his uncle's sawmill. Soon, he met Johnelle, a 16-year-old from Heber Springs. By age 21, Johnnie Hunt was trying to design a way to package and distribute wood shavings for poultry litter. "I'm in high school, and he has me typing letters to manufacturers," Johnelle Hunt recalled. She continued as his partner in business and life until his death and afterward. The Arkansas Business Hall of Fame inducted them as a couple in 2001. At the company she was very involved, collecting debt, keeping the books and paying bills. When Johnnie Hunt died suddenly, she came out of retirement to take the helm of his real estate development company, Hunt Ventures. In the beginning, though, he drove trucks out of Texarkana and Little Rock while she stayed with their children. When he came home, he would "sit at the table and draw and draw and draw," trying to design the machine to package the wood shavings, she said. "He always was thinking. His education was driving those trucks all those years, because he had so much time alone." While driving through Stuttgart, he noticed people burning rice hulls and decided to find a way to sell that byproduct instead. No one had ever managed to find a way to pack them because rice hulls are difficult to compress. Johnnie Hunt eventually did, and the family moved to Stuttgart where, in 1961, they founded J.B. Hunt Co.
Their first year in business they lost $19,000. Ignoring advice to close up shop, the Hunts kept going. "We never lost any money in the rice hull business after that. We got up the next day, and we just kept working," Johnelle Hunt said. Eight years later, at the advice of Hudson Foods founder Red Hudson, Johnnie Hunt made that first purchase of tractors and trailers to haul poultry to the West Coast. After a bank loan, the Hunts were officially back in the trucking business, and they moved to Northwest Arkansas. They did not sell the rice hull business until 1983, when the company went public. It remains in operation today, still using the same machines Johnnie Hunt designed and patented. "The first 10 years of the trucking company were really a struggle," Johnelle Hunt said. "Everything we touched didn't turn to gold, and everything we did didn't work, but we always tried to make it work. When you know the path you're going down is not working, though, you have to know when to stop." "With any innovative company, there will always be things you try that don't work. That's just par for the course with being innovative. The key is to find out how to maintain a degree of resilience that allows you to keep on moving," said Terry Esper, associate professor in the department of supply chain management at the Walton College. Johnelle Hunt agreed, saying resilience and lack of fear of failure were key to her late husband's success. "We knew if it all failed we could go back to where we were and be happy," she said. "I think that's the secret -- don't be afraid. Because if you're afraid of losing, you'll never make it." When the trucking industry deregulated in 1980, Johnnie Hunt and others were able to take advantage of the free market. When the company went public in 1983 "millionaires were made in one trading day," his son Bryan wrote in a letter marking his father's retirement from the company in 2005. Then Michael Haverty from the Santa Fe Railway Co. approached Johnnie Hunt with a new idea. Haverty had written a thesis in business school about how a railroad and a trucking company should team up to provide door-to-door deliveries, but when he first promoted the idea, people said, "this guy doesn't understand that railroad companies and trucking companies hate each other," Haverty recalled. At that time, as today, the two industries competed intensely for freight. Haverty was confident in the logic of the idea that capitalized on the two industries' strengths. After visiting them in Lowell in 1988, he invited Johnnie Hunt and then-President Kirk Thompson to see how it could work by riding a passenger car on a freight train from Chicago to Kansas City. "We got down to Galesburg, Ill., and J.B. walked over to me and said, 'Haverty, we've got a deal.' I said, 'What's the deal?' He said, 'I don't know, but we're going to do it,'" Haverty recalled. The deal began with a handshake in October 1989, and they signed the official contract in June 1991. "We were both determined it was going to work, and we told our people to make sure that it did work," Haverty said. Despite the overhead cost of new containers and equipment to enable the transitions from tractor to rail, "After a year of business there was $30 million worth of revenue. Today, BNSF [Railway] makes $1 billion annually from that handshake," Haverty said. Last year, J.B. Hunt Transport made about $3.7 billion in revenue from its intermodal segment, comprising about 1.8 million loads and about 60 percent of its total business. "This deal changed the entire landscape of long-haul freight transportation in America," Thompson said. "Many truckers and truck lines scoffed at this new operation and said we would fail. Thinking outside the box ultimately led to one of the best decisions in the history of J.B. Hunt Transport." Haverty also faced skepticism from his peers, though it quickly faded. He was inducted to the National Railroad Hall of Fame, which is housed in Galesburg, due to its history as the site of that handshake in 1989. "There's not anybody in the trucking or rail industries, as far as intermodalism is concerned, more deserving of a hall of fame [than J.B. Hunt]," said Haverty. "He was an entrepreneurial individual. His gut told him when things would work." "It's interesting," explained Matthew Waller, dean of the Walton College and founding chair of the supply chain management department. "If you look at companies historically, when they focus on delivering value to customers, they wind up doing these things that seem counterintuitive." According to Bryan Hunt, chief operating officer at the time, when he questioned why the company should turn over freight to their railroad competitor, his father responded, "The customer wants the best for the least, and that's what the railroad and us can do." The deal would have macroeconomic effects, too. Kent explained that in 1980 about 18 percent of the U.S. economy was attributed to inventory and transportation costs. In 2015, that number was down to 8.5 percent, he said. "A significant portion of that is because we've put trailers on the railroad." J.B. Hunt's commitment to entrepreneurialism and prioritization of customers seem to remain at the company today. "The thing that I know for sure about J.B. Hunt is that they really pride themselves on being innovative," said Esper. "It's not just because they think of these ideas; it's because they have a culture that encourages them." President and Chief Executive Officer John Roberts said the company is "extremely fortunate to have had Mr. Hunt as our founder. His entrepreneurial legacy lives on at our company and continues to motivate us to achieve greatness." Esper said students with work experience at the company "are much more attuned to the issues out there and are looking at those issues in a much more innovative way." Esper is an officer at the council and has been involved with the group for 20 years. "This honor is something we should be particularly proud of in Arkansas," he said. "There was an entire field to choose from, and his contributions were deemed worth recognizing in its inaugural class." "I think it's a representation of the kind of people we produce here in Arkansas." Johnelle Hunt said that while she and her husband thought about quitting, they never thought about moving from Arkansas. When they used to do investor "road shows" to present the company to potential shareholders, "The first thing he would say, is 'We are from Lowell, Ark. -- the center of the universe,'" Johnelle Hunt recalled. "And Lowell wasn't even on the map yet." Recently, my beat led me to two North Little Rock natives who founded a startup in Chicago. Their service matches people with pickup trucks and vans to people and businesses that need bulky things "schlepped," on the customer's timeline with reasonable prices. Meet Schlep: the thing you wish you had the last time you moved. John Godwin (left) and Hunter Riley, childhood friends from North Little Rock, have started a company in Chicago that pairs people with pickups and other large vehicles with customers needing items moved. When Hunter Riley decided to help his brother out by hauling art from his North Little Rock gallery to Chicago in his pickup, he didn't anticipate it would lead to an entirely different career path. While there, someone heard Riley had a pickup and asked for help moving a credenza. Something soon became clear to Riley and his childhood friend John Goodwin, a fellow Arkansan working in advertising in Chicago at the time. Growing up on Topf Road in North Little Rock, the two childhood neighbors always had a friend with a pickup. Not so for many people in places like the Windy City, they realized. So they founded Schlep to match people with large vehicles and brawn to customers who had bulky items too big to be easily moved but too small to justify hiring a moving service. "You're going to call on anyone with a truck and an extra set of muscles if you have something heavy to lift across town," said Riley, who has a background in international development and nonprofit and startup consulting. "We really formed a vision around that ... anyone with a pickup truck, a cargo van or SUV could utilize them in a way to make extra money." "We consider ourselves part of the 'gig economy,' the idea that anyone can plug in through our platform and our marketplace, the vision that individuals with these resources could make extra money." Short-term rental company Airbnb and ride-sharing service Uber are examples of this kind of marketplace, providing platforms for part-time income to independent contractors. Schleppers, as the movers/drivers are called, go through three levels of vetting before they can claim jobs: personality, professionalism and full background checks. "We're offering an independent contractor network for people to make extra money with the neighborliness from Arkansas, the idea that the person delivering your things is someone you'd want to have a conversation with," Riley said. The company's tagline, "Your Neighbor with a Truck," encapsulates this. "We're just two Arkansas boys bringing Arkansas values to a Chicago-based company," Riley said. Once the pair started digging into the issue, it became clear that there were individual and business needs for this service. Event planners, interior designers and furniture stores previously had to rely on expensive and large moving companies and courier services often unable to handle quick turnarounds. "We still Schlep for consumers who have a one-off need like for a move, but we primarily plan to make ourselves part of the local logistical business, insert ourselves into this ecosystem," Riley said. "Prior to using Schlep, we would contract out our Chicago-area moves to different providers. This was costly and not scalable," said Schlep customer Michael Stone of Interior Define, a Chicago furniture store. "Partnering with Schlep provides us with the security and efficiency to handle any type of move and has really made a huge impact on our business in Chicago." "Everyone wants to associate our business as the Lyft or Uber of," Riley said. "But we never saw that as the end-all, be-all of the company. We've adopted a hybrid model." Independent contractors range from people with seasonal jobs and students to Crossfit instructors. These "Schleppers" get first dibs on jobs posted on the Schlep app, planned generally a week in advance, unlike the instantaneous Uber or Lyft. However, also unlike the popular ride-sharing services, Schlep has six full-time employees who do deliveries, promote and work events, and train independent contractors. Full-timers are relied on if no one is able to take a job. All contractors are paid per move. Each delivery's price is determined based on how far something has to go and how many "obstacles" are involved, like a staircase or elevator. Riley estimates a typical Schlep is a sectional sofa moving about four miles with one obstacle, which costs about $75-$80. "Honestly, I think it's one of the best workplace environments, because we [Schleppers] create it," said Josue Barrera, who has replaced two part-time jobs with a job with Schlep on his own schedule. "Yes, the standard set by Schlep is high in regard to quality, but I'm practically working for myself. I'm my own boss. "I think of Schlep as a broker providing customer leads. I just show up and do the easy part -- lift couches, etc." Since their first Schlep delivery on Sept. 1, 2014, the company raised investment capital and has now set a goal of $1 million. They currently handle hundreds of jobs per month. "It is a great idea -- simple and beneficial for the community, especially on short notice," said Aaron Wolf, a part-time contractor and full-time outfitter and wilderness guide. "People love it." Riley and Goodwin hope to expand the company nationwide. "The ultimate vision is to really define the Schlep niche," Riley said. "We think this is a niche that doesn't yet have a solution. It's too often defaulted to people doing it themselves or having to spend way more money than they should." Rite of Passage for any Business Reporter? ...the first quarterly earnings story! Mine is about trucks and trains. For those unaware, I recently moved to Fayetteville, AR to start a job covering transportation for the business desk of the Arkansas Democrat-Gazette. Needless to say, it's been a bit different than Southeast Asia. However, this paper has proven a great, stable place to start out a career as a business reporter, full of smart people willing to answer my many questions. This article was published 07/19/16 at 5:45 a.m.
J.B. Hunt Transport Services Inc. reported Monday its second-quarter net income was up from last year, but for the second year in a row, the company missed analysts' earnings predictions for the period. A net income of $105 million, or 92 cents per share, was a 1.5 percent increase for the Lowell-based company, from $103.4 million or 88 cents per share, for the same quarter of 2015. The company posted $1.62 billion in revenue, up about 5 percent from last year's $1.54 billion. The average of 25 analysts polled by Yahoo Finance had predicted 97 cents per share for the second quarter. Revenue matched the average of 19 analysts' estimates. The company lowered its expected earnings for 2016 to 7 percent, from a previous 9-12 percent projection, citing higher rail costs and "customer rate behavior." Shares dropped more than 4.5 percent in trading on the Nasdaq exchange Monday, after the release. "I think basically the messaging is the pricing environment has become more competitive. Specifically there are probably customers pushing back on pricing because there are other transportation options. The greatest competition is coming from other trucking companies," explained Brad Delco, a transportation analyst for Stephens Inc. in Little Rock. J.B. Hunt's intermodal revenue increased by 3 percent, from $904.9 million in 2015 to $933 million this year, rebounding to close to its 2014 levels of $930.7 million. The company explained that last year's issues with West Coast ports have continued to be mitigated, pointing to continued load growth in both its eastern and transcontinental networks. J.B. Hunt is the largest intermodal truckload carrier in the United States, meaning shipping of freight containers using multiple modes of transportation. The intermodal segment's operating income was down 11 percent to $105.6 million from $118.6 million in 2015, reportedly due to rail purchased transportation, equipment costs, insurance and claims, and driver recruiting and retention. Intermodal operating income now represents 60 percent of the company's total, down from 68 percent in 2015. "Usually rail is a cheaper mode of shipping than truck, but because of a loose capacity in the trucking market, pricing has gone down so much that it is encroaching upon some of the intermodal demands," Delco said. In addition, rail companies have raised their prices to make up for a decline in coal output, traditionally a significant portion of rail freight. J.B. Hunt's trucking division maintained about the same revenue as the previous year, posting a 1 percent increase with the total remaining around $98 million. Its operating income decreased by 9 percent to $8.9 million, due to "lower rates per loaded mile, increased driver hiring costs, higher independent contractor cost and increased tractor maintenance costs." The division also spent about $700,000 on streamlining and technology redevelopment. The company's brokerage segment posted the most striking increase in revenue and operating income. Revenue was up 17 percent to $204 million, in part due to a 62 percent volume increase offset by lower fuel prices and change in freight mix. Lower fuel costs have both hurt and helped the company. Its fuel-surcharge revenue accounts for less than 10 percent of its total revenue and fell 27 percent to $131.7 million. However, its fuel expenses decreased 16 percent to about $71.5 million. The brokerage division's operating income increased 122 percent to $10.9 million, following last year's promise that the $4.4 million cost of streamlining and technology redevelopment in the second quarter of 2015 would pay off over the following two years. Another memory from my time in Cambodia...this one with a distinct Texan twang. Lao Millionaire's Mansion under Construction...Versailles Anyone? As some of you know, I chose to visit Vietnam, Cambodia and Laos because of their history as French colonies. With experience in France and much study of French and French history I wanted to see what vestiges remain of this colonial past. The short answer? Not a whole lot, and yet, so much. In 2014, only 3% of the Cambodian and Laotian populations spoke French. In Vietnam, that number was a mere .7%. The few francophones I met in the region were octogenarians. The three countries remain members of the International Organization of La Francophonie though. I found this most obviously in museums and restored archaeological sites, from Hanoi’s Museum of Ethnology to the Temples of Angkor, where you often find signs reminding visitors that the French government helped fund restorations. When Luang Prabang, Laos was named a UNESCO World Heritage site, various levels of the French government and the EU sponsored a partnership with Chinon, France because of the “amazing similarity of these two ancient royal capitals.” Chinon has since imparted some of its conservation and culturally-conscious development expertise to Luang Prabang as the charming Lao city struggles to preserve its heritage without hampering growth. Similarly, in 2004 the French government organized a three-year project on museum architecture and museology in Vietnam because, according to the Consulate in Saigon’s cultural attaché, “The Ministry of Culture and Information is very concerned about Vietnam’s international image.” (Schwenkel 159). Regardless of present projects, culture will always be a major component of France’s historical legacy in Vietnam. France established the country’s first school of fine arts, Hanoi’s École Supérieure des Beaux Arts de l’Indochine in 1925. And then there is, in my opinion, the modern Vietnamese written language. Before the European missionaries landed, written Vietnamese consisted of characters, like Chinese. Building on the work of earlier Portuguese missionaries, Frenchman Alexandre de Rhodes took it upon himself to officially “Romanize” the language and published the first Vietnamese-Latin-Portuguese dictionary in 1651. This new language, known as qúoc ngú or national language was exclusively adopted after liberation from the French (ironically enough), but retains traces of its transcriber's native language in the spelling of certain words (Điện Biên Phủ anyone?) and in the meanings and phonetics of others (cà phê for one…). While by no means a linguist, I was constantly struck by Vietnamese words that looked and sounded almost French. Coincidence? So what is the legacy? On one hand, some could argue, as in the words of this French-educated Cambodian Prince: “There is no more French influence in Cambodia. The French try to keep a presence through the French institute, but it’s just the way to spread the French culture and to preserve French interests.” On the other, you can find evidence of the French woven into Indochinese societies almost everywhere, if you’re looking for them. I met many interesting and enterprising beer-lovers during my travels. Here are just some of their stories. 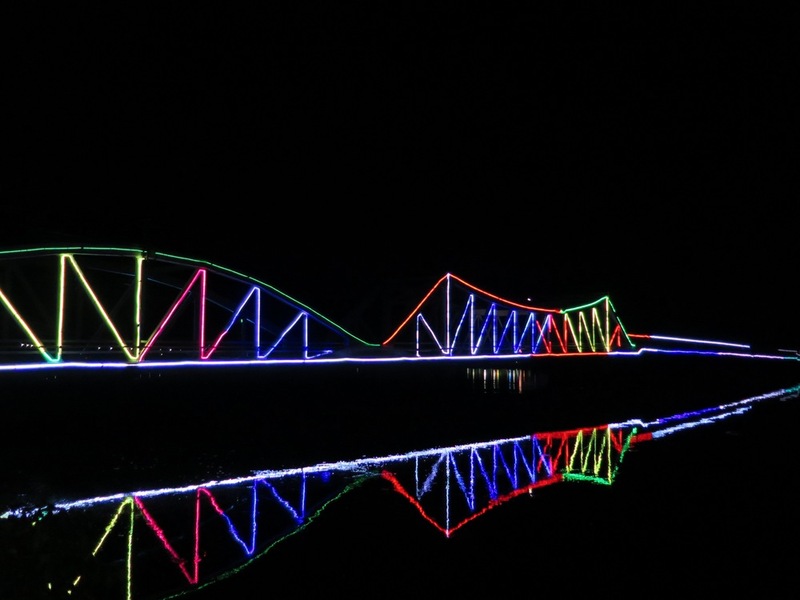 They also speak to Vietnam's rapid development. Twenty years ago, people mostly rode bikes. A decade ago it was almost all motorbikes and bikes. Now, motorbikes still reign, but more and more cars appear daily. There were reportedly 2.5 million registered in 2015. The Vietnamese government taxes cars at 100%, but that will change soon thanks to the ASEAN trade bloc and TPP. 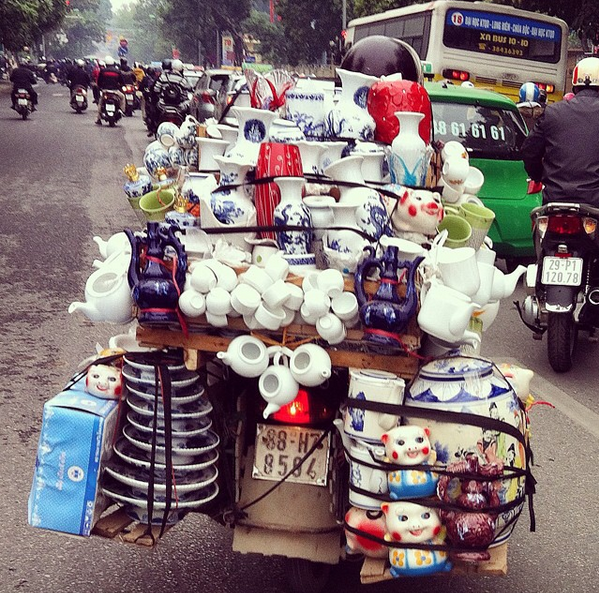 For now though, as my Vietnamese friend told me, "Boys know if they want a girlfriend, they need a motorbike." Everyone and everything physically possible rides a motorbike, which makes for some impressive, disturbing and hilarious scenes on the streets. I've asked friends who live in the region, crowdsourced from Facebook and recorded my own memories into the following list of things spotted on the streets of Vietnam. Some people have kindly shared their photos with me, which I've combined with some of mine to help make the point. To those who live in the region, this is everyday; for newcomers (like me), it never ceases to amaze. "One time I saw...on the back of a motorbike." P.S. Bikes of Burden is a good photography book that covers just this subject. During the “Secret War” in Laos between 1964 and 1973, the U.S., through the military and the C.I.A., had two main goals. They organized and supported a militia of Laotians to fight the Communist Pathet Laos and later tried to interrupt traffic on the Ho Chi Minh Trail (the supply route from Northern Vietnam down to its forces in the South). If you haven't heard about this, you aren't alone. At the Geneva Conferences in 1954 and 1962 Laos was guaranteed neutrality. But the U.S. built hundreds of landing strips in Laos for the initial purpose of providing aid to the country. Later, these served a more deadly purpose. American politicians always maintained the official line: that the Laotian government had requested armed reconnaissance missions over the country. However, the U.S. bombed Laos more than Germany and Japan combined during World War II. When averaged out, we dropped a planeload of bombs every eight minutes, for nine years straight. That’s over two million tons of ordnance. About a third of them did not explode though, which has created a very dangerous, ongoing problem for the Laotians living in those regions. About a quarter of the country’s villages are contaminated with unexploded ordinances, or UXOs. I was in Laos for some time before I learned about this problem. And while I’ve gotten (sadly) used to hearing stories about negative things the American government and military has done around the world, this story really stunned me, especially because of the nature of the Lao people. Today, over 40 years later, less than 1% of the UXOs have been destroyed. So, Laotians continue to be killed and harmed by them. 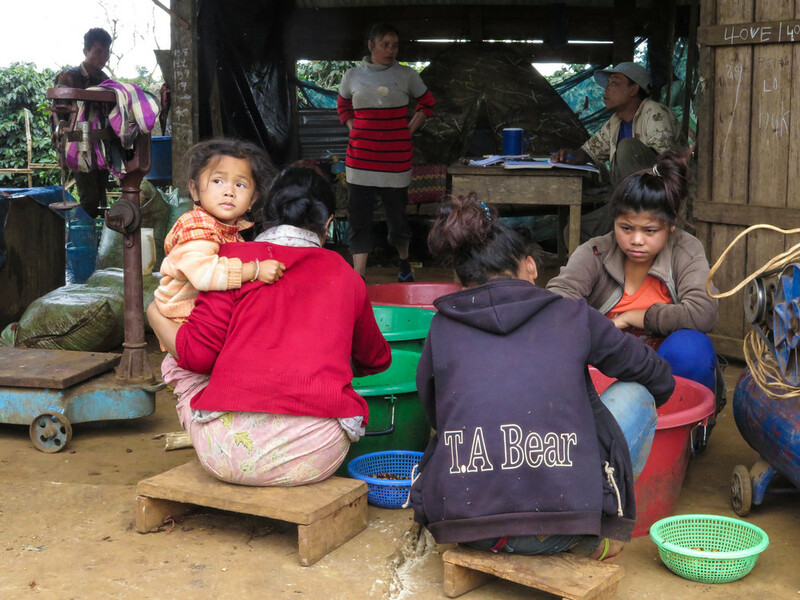 Like in many other regions with UXOs, 40% of the Laotian casualties are children who see something interesting and do not recognize the danger. I visited the Lao National Unexploded Ordnance Programme (UXO LAO) center in Luang Prabang, where they play a video about the history and a video produced to educate Laotians about the danger. The latter starred four children who had been disabled in some way from a UXO. While their injuries were very difficult to hear about, the worst part of the film came at the end, when each child took the screen to warn their peers: “Don’t be like me. Don’t dig for worms and get hurt by a UXO.” Or “don’t build a fire and get hurt by a UXO.” “Don’t be like me and search for scrap metal….” Children shouldn’t have to worry about UXOs when they dig for worms or build a fire for their families. To me, that’s the worst injustice of the whole situation. While we’ve never officially acknowledged our dark past in the country, the U.S. has spent the most of any other countries on the Laotian UXO cause. In large thanks to the lobbying of a Laotian-American woman, we recently increased funding from about $3 million to $12 million per year. That’s great, until you realize we spent $13.3 million (adjusted) per day for nine years straight bombing the country. KAMPOT - I took these photos of the Brateak Krola Lake (or “secret lake”) north of Kep, Cambodia and of the “old bridge” in Kampot. Beautiful, right? 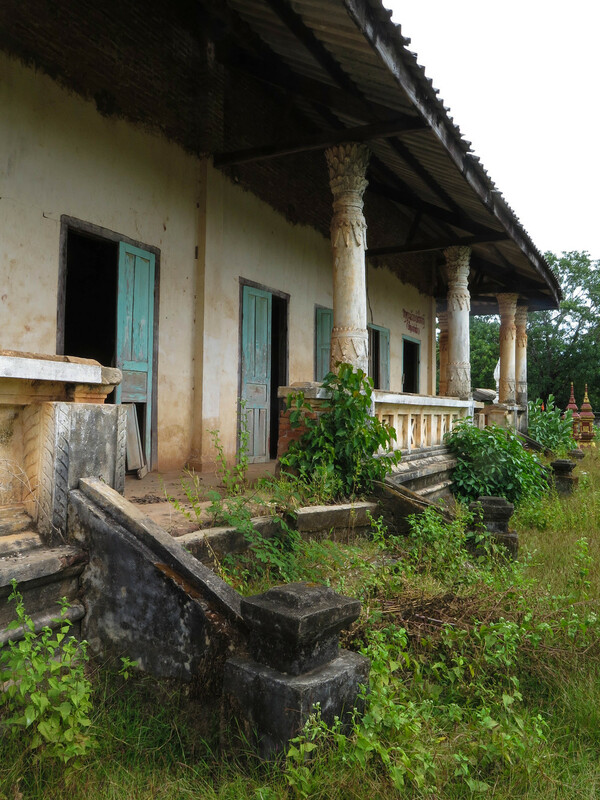 They also happen to be evidence of the atrocities of the Khmer Rouge regime from the 1970s. Soldiers forced Cambodians to build the bridge and to dig the lake with hand tools. We will never know how many people died in the process. But today, they are simply part of the landscape. To me, they embody how the genocide functions in Cambodian society today. For those who don’t know (like me, circa 2014), or those don’t remember, here’s the synopsis: The Khmer Rouge were the armed wing of the Communist Party in Cambodia. They (led by Pol Pot) officially controlled the country from 1975-1979 with the goal of returning it to an agrarian utopia by starting over at “Year Zero.” Meaning, they forcibly emptied the cities of their residents and literally marched people onto inefficient collective farms. Anyone with education, who spoke another language, who wore glasses, who had a connection to the previous government, etc., was targeted, often tortured and killed. They abolished money and private land ownership. Somewhere between 1-2 million people, (nearly a fourth of the population) died, and the entire nation was left traumatized and undernourished. It’s indisputably one of the worst human catastrophes in recorded history. As I traveled the countryside I thought about what it must have looked like when the Khmer Rouge marched hordes of the population to those nonsensical collective farms. I can’t help but wonder what horrors the trees and mountains have seen. If that isn’t enough of a reminder, there’s the conspicuous lack of elderly people. For the most part though, it seems that the average Cambodian does not think about things like that. Well, some do. I spoke to a survivor of the infamous Tuol Sleng security and torture prison in Phnom Penh. (Somewhere between 12,000-20,000 inmates, 12 survivors: you do the math.) He said that at first he never spoke of his time there. But he now serves as something of a spokesman for the museum, with an autobiography published in several languages. He told me that since opening up about it, “it has become easier to live.” It’s worth mentioning that the other, younger Cambodians I asked (carefully) about it matter-of-factly told me of their family’s history at that time. I think the overarching point is that people don’t sit around feeling sorry for themselves. Many of them are too busy struggling to put food on the table. That being said, the Cambodians are not in a good way. By destroying the entire educated class (doctors, teachers…) the Khmer Rouge brought the nation to its knees. While it’s apparently getting a little better, corruption remains rampant. Government officials have pocketed much of the billions of dollars of foreign aid money that have streamed into the country over the past decades. People do not feel that their own government has their best interest at heart, with very good reason. Education is only free through grade nine, so less than thirty-five percent of the population attend secondary school. Those that attend school normally have to pay bribes to their teachers every morning. Ditto if you need medical treatment. Alcoholism is rampant. And yet, there is some hope. Almost 70% percent of Cambodia’s population is under the age of 30. As a different UN employee told me, something like 90% of that age bracket voted for the opposition in the last election. Despite their poverty, many of these Cambodians have cell phones, and relatively more access to the outside world than their forefathers. Industry continues to grow in the country as it moves away from a rice-farming base. The poverty rate has dropped by half since 2004 (though many remain on the brink). I spoke to several Southeast Asia travel veterans who warned me “Be careful! Everyone is trying to scam you in Cambodia!” All of the above is what I think about in response to that stereotype. Not as a way to justify, but as a way to contextualize. P.S. 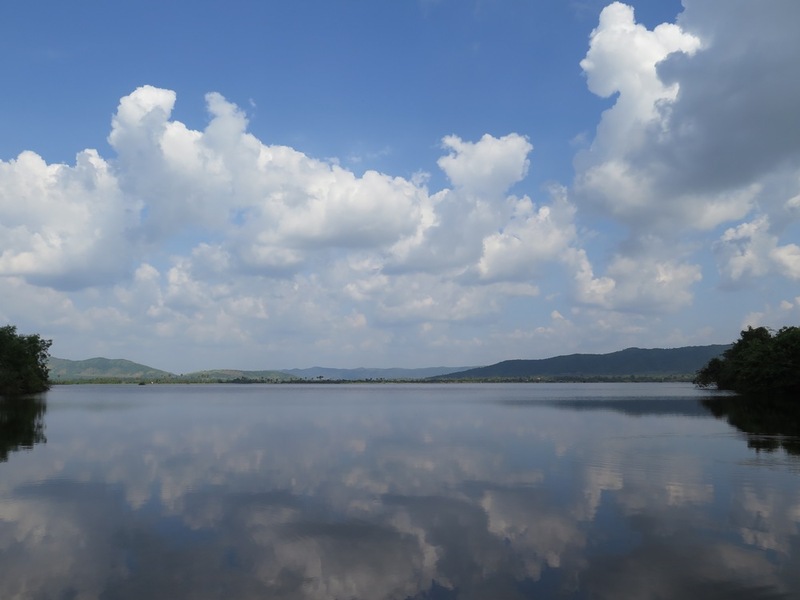 I had a long internal debate about what topic to address in this post on Cambodia. I didn’t want to write about the genocide at first, because it seemed well...lazy. While I learned about other fascinating things like government corruption, orphanage scams, spirit houses, the LGBTQ population and the craft beer scene, I couldn’t shake this out of my head. What can I say? I’m a student of World War II history. And it shocked me how little I knew about this genocide before coming here. P.P.S. Recommended reading for further information: Cambodia's Curse by Joel Brinkley, First They Killed My Father by Loung Ung. DANANG - “Most people think Buddhism is the biggest religion in Vietnam. It’s not. We have a different national religion. We worship our ancestors,” said my Vietnamese friend, Jack, over his mother’s homemade snake wine. His sentiment is one I’ve heard repeatedly, from even the most Western-influenced and sophisticated of Vietnamese. While ancestor veneration isn’t unique to Vietnam, I’ve come to appreciate it as a foundational facet of Vietnamese culture and one of the largest remnants of Confucian influence. As I’ve understood it, ancestor veneration tells of the admirable strength of the family unit and the beautiful Vietnamese way of dealing with death. Family comes first here. Most homes house three generations, and children commonly live at home until they marry. Children grow up with a powerful respect and feeling of responsibility towards their families and their elders. The eldest sibling’s responsibility usually includes moving in with and taking care of parents and grandparents, as well as helping to fund their younger siblings. Let’s call it the antithesis of the nursing home. In fact, Vietnamese language structure demands that you refer to everyone you speak to with a specific pronoun denoting their gender and age in relation to you. People must be constantly aware of where they stand in the age hierarchy, and this childhood respect for elders lasts through life. When someone dies, especially an older person, the existing respect and obligation continues and even escalates to a different level. When people die, their survivors do not consider them “gone.” Families gather regularly at the altars present in almost every home to pray to their ancestor, to ask them for help, to keep them involved. Often this happens on the first and fifteenth days of every lunar month, and at several annual holidays, like Remembrance Day, when everyone goes to visit and clean up their relatives’ gravesites. Photos of the deceased, incense, food, fake money, and other offerings are often present. Ancestor veneration bonds families together in ways I don’t think we have in the USA and helps instill the aforementioned reverence for ancestors and family. 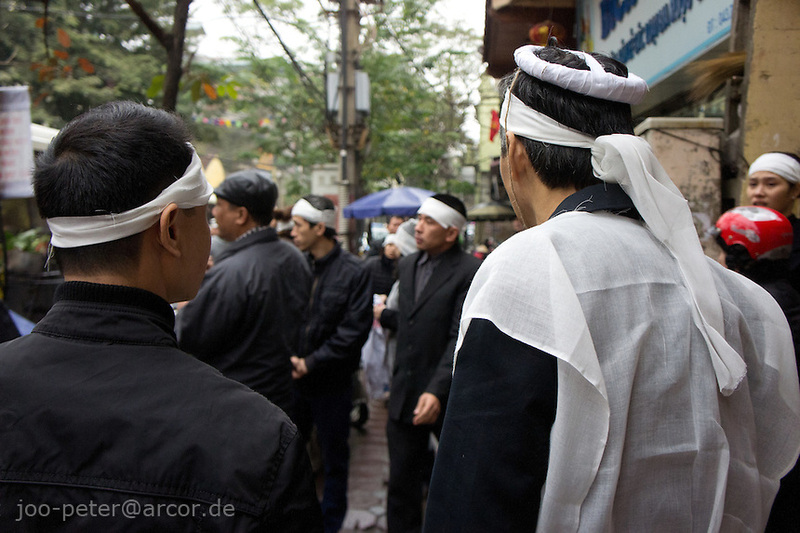 The Vietnamese customs of mourning too reflect the veneration of family and ancestors. When someone dies, their body remains in the house, where family members clean it with alcohol and water, and dress it special white death clothes. The immediate family usually wears white outfits, and mourners wear white headbands. 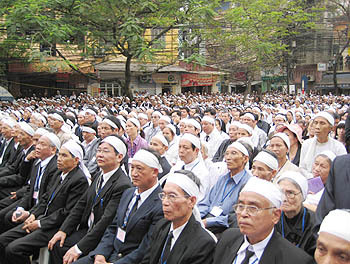 Rather than black, white dominates Vietnamese funerals. The body then basically lies in state in the center of the house until burial. Then there is a giant party. Everyone is invited, from coworkers to neighbors to your friend’s friend that got invited randomly. And while customs vary all over the country, people feast and celebrate. In the north, the music and mood is traditionally more somber. In the south though, the music I’ve encountered is this interesting jazzy sound, sounding almost straight out of New Orleans, with trumpets and saxophones (see the video below!). I met one jazz musician who moved here expecting to have a lot of trouble finding a part to replace in his saxophone, only to discover they were plentiful because of the funereal usage. Saigon especially is known for some crazy, drunken funeral parties. If the deceased loved karaoke, you sing karaoke until the wee hours of the morning. As one southerner told me, no one in the neighborhood will complain about the noise because they know it’s a funeral. The parties do not stop there. Some families celebrate their deceased again on the 49th and 100th days after the death. Then, every year, the family will continue to celebrate the deceased’s death anniversary in a party that completely outdoes any birthday parties. Birthdays aren’t very big here. But deathdays are huge. And then there is Tết, the Lunar New Year, which is the biggest holiday of the year and usually falls in February. As one Vietnamese seminarian put it in his thesis on ancestor veneration, “For the Vietnamese people, it is the equivalent of Thanksgiving Day, Remembrance Day, New Year’s Day, and birthdays all combined into one massive celebration.” While the official celebration lasts five to seven days (depending on the lunar calendar), people take weeks off work, and everyone travels back to their ancestral village. There are many traditions and customs associated with the holiday that vary from locality, but the big theme remains family, living and dead. The first part of the celebration (new years eve) is all about the ancestors, where as one Vietnamese woman told me, “we pray at the altar and invite all the ancestors to come celebrate with us.” I love this: every year, you reunite the entire family, dead or alive, far or near. And at the end of the holiday you bid them farewell (but only until the next year). Ancestor veneration is widely considered part of Vietnamese culture, not really a religion. In fact, most of Vietnam identifies as not religious (remember, it is still a titular Communist country). The Vietnamese Catholic Church officially asserts that ancestor veneration does not conflict with the tenets of Christianity. Christian ancestor altars usually feature Christian imagery as well. There is a Vietnamese saying: “The Orientals believe in the dead, while the Occidentals believe only in death.” To me, the Vietnamese deal with the elderly and death in general in much healthier way than we do in the USA. Instead of the intense but compressed and compartmentalized funeral procedures we follow, the Vietnamese dead are celebrated over the long term. Survivors aren’t able to push away the pain of mourning because they remain regularly reminded of their deceased, both through these celebrations and regular time at the altar. It would make me more comfortable about death to know that my family will continue to honor me, gather together and talk to me, and have some great parties and great times in my honor. I’m thinking I might like a Vietnamese funeral someday. Apologies for the low quality! Well, sort of. He was paraphrasing Thomas Jefferson of course. His subsequent sentences read: “This immortal statement was made in the Declaration of Independence of the United States of America in 1776. In a broader sense, this means: All the peoples on the earth are equal from birth, all the peoples have a right to live, to be happy and free. The Declaration of the French Revolution made in 1791 on the Rights of Man and the Citizen also states: ‘All men are born free and with equal rights, and must always remain free and have equal rights.’ Those are undeniable truths.” And then, mirroring Jefferson’s format, Ho went on to list the grievances of the Vietnamese against its colonizers. Ho Chi Minh was speaking to Hanoi on September 2, 1945, proclaiming the independence of the Democratic Republic of Vietnam from the “double yoke” of its French and Japanese controllers. It would take nine more years of fighting for that independence to become a reality and twenty more to reunify the country, but to this day Vietnam counts September 2 as its independence day. 2015 marks its 70th anniversary, as the propaganda posters remind me constantly. Ho Chi Minh continues to loom large in modern Vietnam as the man who led the long fight for Vietnamese independence against the French, Japanese and Americans. Prominent portraits of him never feel out of place. They are in every classroom, and prominently displayed for tourists and Saigonese alike in places like the Post Office and through a brand new larger-than-life statue of him in front of Ho Chi Minh City Hall (literally larger-than-life; he was only about five feet tall). “Uncle Ho” is simply a legend. You can even view his embalmed body in Hanoi. But considering how strong a reputation he maintains 46 years after his death (also on a September 2, in 1969), the man led quite an enigmatic life. First of all, this Vietnamese icon left Vietnam in his early twenties, not to return for thirty years. He traveled the world using many different aliases as he went. He worked a range of jobs, from pastry chef to waiter, gardener to oven stoker, photo retoucher to newspaper editor. He picked up English, French, German, Chinese and Russian, and got involved with politics early on. He reportedly concluded quickly that the French colonists were not at all “civilized” enough to be trying to “civilize” his own people. As evidenced above, he studied the French and American revolutions and made Indochinese independence his life’s cause. Hearing of and believing in Woodrow Wilson’s ideas for national self-determination, he went to the Peace Conference of Versailles in 1919. He had prepared to present a case for basic freedoms and equality for Indochina, but he was not received. After this disappointment he decided to throw his lot in with the Socialists. However, he soon switched again and helped found the French Communist party, which seemed more likely to help liberate Indochina than the “equivocating” Socialists, as it was put in an over 4,000-word obituary. He helped start and edited a weekly newspaper called Le Paria (The Outcast), giving voice to a group of French colonial exiles in Paris from Africa, the Caribbean and Asia. He moved to Russia and met Lenin: the start to a game-changing relationship with the Soviet Union. He joined a Soviet group in China supporting Chiang Kai-shek in the 1920s until Kai-shek broke with the Communists. Ho was put in British jail in Hong Kong for “subversive activities,” went to school back in Russia and helped a Chinese Communist army fighting the Japanese in the late 1930s. Somewhere along the way the French sentenced him to death in absentia because the Indochinese Communists had supported a peasant rebellion. Eventually, he returned to his homeland with an international reputation and many ideas about what should happen in Vietnam. He founded the Viet Minh in 1941, an underground Communist group whose charter prioritized nationalism over Communism. Ho had said, "I was a Communist, but I am no longer one. I am a member of the Vietnamese family, nothing else." Since Ho was fighting the Japanese governing Vietnam during World War II, the Americans helped him get out of Chinese jail. He was considered a U.S. ally at the time of his independence speech and even tried to verify the Jefferson quote with an American intelligence officer. The American couldn’t remember though, and deferred to the Vietnamese leader on this matter of U.S. history. However, as we know, this alliance would not last. Say what you will about Ho Chi Minh (and indeed, much has been said), but he succeeded. He dedicated his life to seeking independence for his homeland. He officially led Vietnam against the Japanese, fought back the French for nine years after and pushed for unification with South Vietnam until his death. And today, Vietnam stands unified, in large part because of this slight man. I just spoke with a group of South Vietnamese twenty-somethings in Ho Chi Minh City about their city’s namesake and a unified Vietnam. While they had conflicting feelings about how the country is run, and about whether they prefer rule from the north to divided rule, they all agreed on one thing: “we are proud of Uncle Ho.” It’s true that they receive no nuanced historical information about him in school, but even so, he’s a legend for a reason. A fascinating article about gender relations in Vietnam explains that “instead of liberating the women, as claimed, the government has put a ‘second shift’ on the women: they work outside the home in addition to carrying out their domestic work.” A new generation of well-educated middle and upper class women now knows professional success. However, as a friend working for an international company in Hanoi explained, her female Vietnamese coworkers often turn down promotions. They feel they cannot handle the extra responsibility with all they are expected to do at home. Traditionally, when a Vietnamese woman marries a Vietnamese man, she basically becomes a part of his family: she moves in with them, takes care of his (sometimes extended) family and does the lion’s share of the housework. A Vietnamese friend of mine has been married for a year, but because her husband currently works abroad, the only socially acceptable place for her to live is with his parents, where she cooks and does the dishes alone most nights. I went over for dinner and witnessed this in action. She was the only member of the family serving and cleaning up. The twenty-seven-year-old law school graduate can neither live with friends nor alone, for fear of upsetting her own family and her in-laws. Notably, she begrudges her situation and wants a change. Her husband seems to agree. He helps her with the dishes when he is around. I have heard the same sentiments from other young Vietnamese and made the unoriginal conclusion that things are gradually changing. Like many generations in societies around the world before them, as young Vietnamese people are exposed to other ways of life, they seem to be pushing back against traditional expectations, including the inescapable issue of marriage. In Vietnam people commonly ask about relationship status, even of strangers. I can attest to this personally. “You aren’t married? Why not? Oh, your boyfriend is away? Why is he not here? Maybe a Vietnamese man would be better. I have a nephew….” I met one American who lived here happily for many years and learned fluent Vietnamese, but finally decided to leave when she realized the incessant questions about her relationship status were not letting up. Imagine having to answer, “Why are you single?” every time you go to the market. I have however spoken with young Vietnamese who insist they do not want to get married, despite the constant pressure. Several have told me that their parents are urging them to “settle” for a spouse, rather than wait “naively” for love. Those young people still plan to disregard the expectations. They have seen peers unhappily trapped in marriages they "settled" for. An American friend was feeding his baby in a restaurant in Hanoi the other night, and a Vietnamese waiter commented, “That’s the strangest thing I’ve seen all day: a man feeding a baby.” Today though, I saw a young male Vietnamese man holding his baby. He’s the only one I’ve seen so far, compared to hundreds of women, but still. I also saw my first male garbage collector yesterday. Progress? Slowly maybe, but the times, it seems, they are a changin’. In the meantime, I remain in awe of the work ethic of Vietnamese women. P.S. If you want to learn a lot more, here’s another thorough take on gender equality and feminism in Vietnamese history and contemporary society. HO CHI MINH CITY - I’m not sure what I expected to do when I first arrived in Saigon, but it certainly wasn’t decorating for Halloween. And yet, in my jet-lagged stupor, I found myself doing just that, for a Halloween party my hosts were planning. Ironically, Halloween has characterized my inaugural days in this city, country and continent. I’ve asked everyone I could about the holiday in Vietnam, from expats to taxi drivers. I have found no data and only one article on the subject. Based on my language-constrained research, the consensus is that 2015 is the first year Halloween has been “so big” in HCMC. Meaning, most people seemed to know what Halloween is, and many main streets had signs of the holiday: themed decals on store windows, Halloween deals and events at bars (publicized in English), random decorations, sporadic costumes and groups of young trick-or-treaters. I found temporary structures in the middle of shopping malls selling all the typical Halloween costume regalia: capes, animal ears, wings, Rapunzel wigs, grim reaper masks, you name it. One of these structures (titled “Castle Freak”) featured a haunted house photo shoot background and costumed employees dancing and singing to pop music. (Sort of like posing with Santa at Christmas.) As one expat told me, Halloween has come to Vietnam by way of commercialism. I witnessed an expat Halloween with my hosts and their young children and a Halloween on the streets of downtown Saigon later that night. The expat version felt familiar, complete with pumpkin sugar cookies and cupcakes. However, when it came to chaperoning the children’s trick-or-treating, we basically played a game of “which house does Halloween?” Those with obvious decorations were ready with candy. The rest were hit or miss. Some had candy but seemed unsure exactly of the protocol for giving it out; others thought the gaggle of children on their doorstep just wanted to come inside. Universally though, bystanders seemed to enjoy the whole trick-or-treating spectacle. Everyone smiled. Several people took photos. I had purchased my costume that day at one of the aforementioned vendors, and it was admittedly weak: a gold cape and a purple Mardi Gras mask. I decided to go for sparkle over content. My two friends put more effort into their much cooler costumes: snow fairy and creepy doll. Surprisingly though, the three of us made something of a celebrity attraction while walking through a packed Nguyen Hue promenade at 11pm. A crowd of Vietnamese strangers gathered around, each wanting us to pose for photos with every member of the family. In keeping with the smiles, Halloween here felt happy, not scary. The costumes of locals seemed to mostly consist of purchased accessories with regular clothes, whereas expats were decked out with the morbid face paint, etc. Halloween in Vietnam is being forged through commercialism, parties and fun, not as a spinoff of a “day of the dead” type celebration. Ultimately, the happy fascination of the Vietnamese sums up how Halloween felt here. Walking down the street in our costumes, people on motorbikes and on the sidewalk would stare, then always smile and wave. The Vietnamese seemed enchanted by the trick-or-treaters, and the (albeit few) gaggles of Vietnamese trick-or-treaters were having the time of their lives. Vietnam doesn’t traditionally have any comparable “dress up as whatever” holiday like Halloween or Purim, so this is new. Even if it were associated with the dead, I don't know if it would be scary. Ancestor veneration is common in Vietnam, a country influenced by a mixture of Buddhism, Confucianism, Daoism and Christianity. Some of the illuminated altars you often find in Vietnamese businesses and homes are dedicated to deceased ancestors. The dead are thought to have the power to bring good fortune and protection to the living, in exchange for commemoration and respect. “The ritual is an expression of a spiritual belief that the world of the living and the world of the dead are not dichotomies, but rather, a shift of being, and a new becoming,” as one Vietnamese doctoral candidate wrote in a journal article on the subject. In this way, death does not seem to be associated with creepiness or morbidity. Ghosts aren't even traditionally considered that disturbing; they just have some unfinished business to work out. So, why would Halloween, or something connected with the beyond be scary? At least, this is my working theory. Any input is appreciated. Regardless, Vietnamese Halloween definitely felt like a success. I even won second runner-up in a costume contest (somehow). Based on the enthusiasm we saw on the streets, I would expect next year’s Vietnamese Halloween to be even bigger, with more local participation. Guess we will all have to come back and find out.